Making the holidays more fun for hospital patients is one of the simplest things that hospital staff can do to alleviate the pains and difficulties that come with being sick. We have some helpful tips on how you can help make patients spending the holidays at the hospital not feel too left out from all the holiday celebrations going on while they’re away. 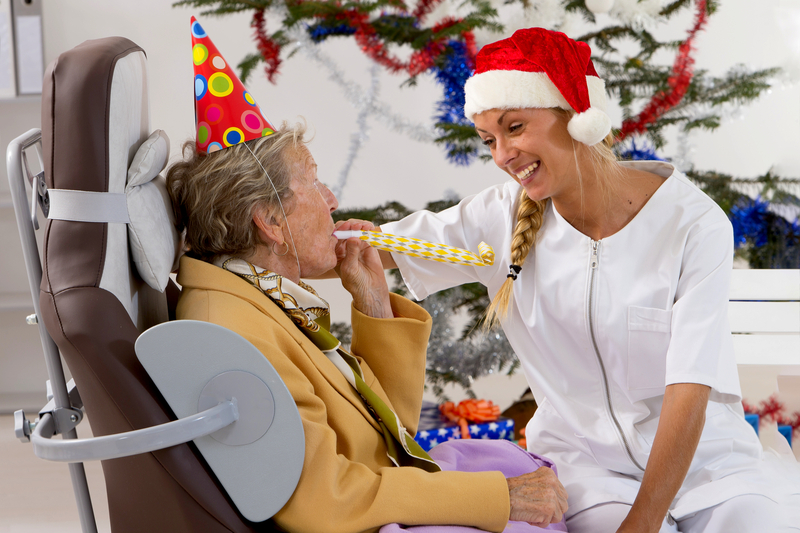 There are many things to consider when it comes to hospital holiday celebrations. There are always people of different faiths, as well as different restrictions brought about by various illnesses. Gift-giving is traditionally at the core of the holiday season! Simple gifts like toy bundles for kids, blankets for babies in the NICU and those in elderly care, or funny holiday-themed sweaters for adults are easy ways to bring in the holiday cheer for your patients. One of the best things about the holidays is that they give people an excuse to get together. There’s always a party or community event taking place somewhere and patients who are spending the holidays in the hospital should not be excluded from the merrymaking. You can arrange for a chorale performance, a small holiday banquet, or a visit from Santa Claus during this time. You can also host holiday movie watch parties, gingerbread building workshops, or something as simple as holiday card-making programs which are a huge hit especially for younger patients. It’s important to remember to include both patients and the families of these patients who are spending the holidays in the hospital and are worn down by the experience as much as the patients themselves. Nothing brings the holiday cheer as much as holiday decorations, whether you go with classic holiday decorations or incorporate medical elements into your decorations. You can achieve this by using certain common hospital items – inflated latex gloves for the tree, pill bottle wreaths, paper cup snowmen, recycled paper lanterns and trinkets, etc. It’s hard to create cheer for the season for people spending the holidays in the hospital, but the simple addition of a few cheery, holiday elements to your professional apparel might just do the trick. While the options are limited, with medical considerations to keep in mind, there are always holiday-themed scrub suits and surgical caps to choose from. Smaller apparel elements can also be incorporated to add to the holiday vibe – badges, stethoscope buttons, and lanyards for staff IDs are popular options. No matter what way you choose to bring the holiday cheer for your patients and their families spending the holidays in the hospital, the most important thing is to make sure that they do not feel excluded from the festivities of the bigger world outside. Holiday cheers and merry wishes your way from your MEDtegrity family!